Arms Embargo Lift Also Means More Regular U.S. Military Visits To Vietnam : Parallels In response to China's moves in the South China Sea, the U.S. has tightened security ties and boosted its military presence in the region. Now Vietnam can host regular visits by U.S. military units. 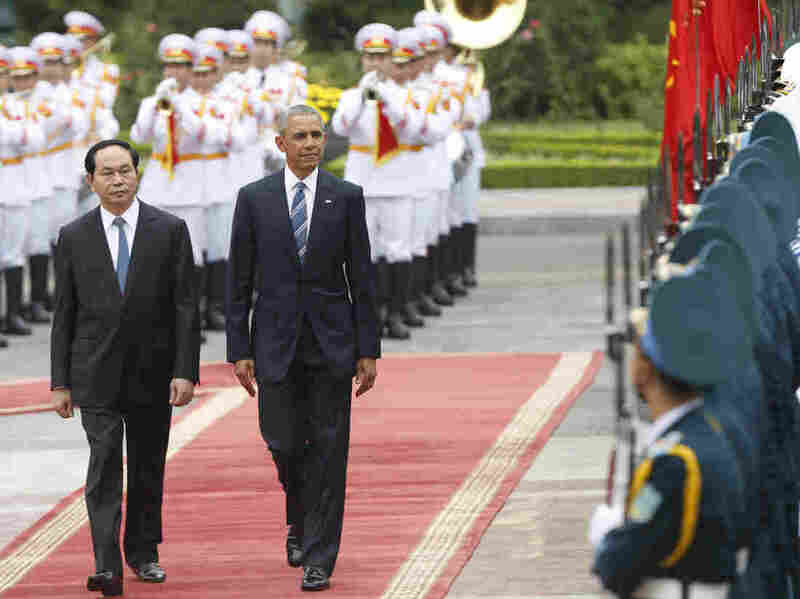 President Barack Obama walks with Vietnamese President Tran Dai Quang as they review a guard of honor during a welcoming ceremony at the Presidential Palace in Hanoi on May 23. President Obama's decision to lift the arms embargo against Vietnam was about much more than selling weapons. It was about sending a message to China. Not only may Vietnam begin buying American ships and surveillance equipment, it could also begin hosting regular visits by U.S. military units, including U.S. Navy warships at Cam Ranh Bay. Such trips would put American sailors square into waters that China is claiming it controls, making clear the U.S. rejects those claims and reassuring China's nervous neighbors in the region — or so Washington hopes. "It is important for us to maintain the freedom of navigation and the governance of international norms and rules and law that have helped to create prosperity and promoted commerce and peace and security in this region," President Obama said. The U.S. engaged in large military operations at Cam Ranh Bay during the Vietnam War more than four decades ago. Giving U.S. ships more regular access into the area may stir up ghosts in Vietnam of that conflict, but the presence of the American warships — which have already visited Vietnamese ports in recent years — could help soothe concern over China's muscle-flexing in the region. 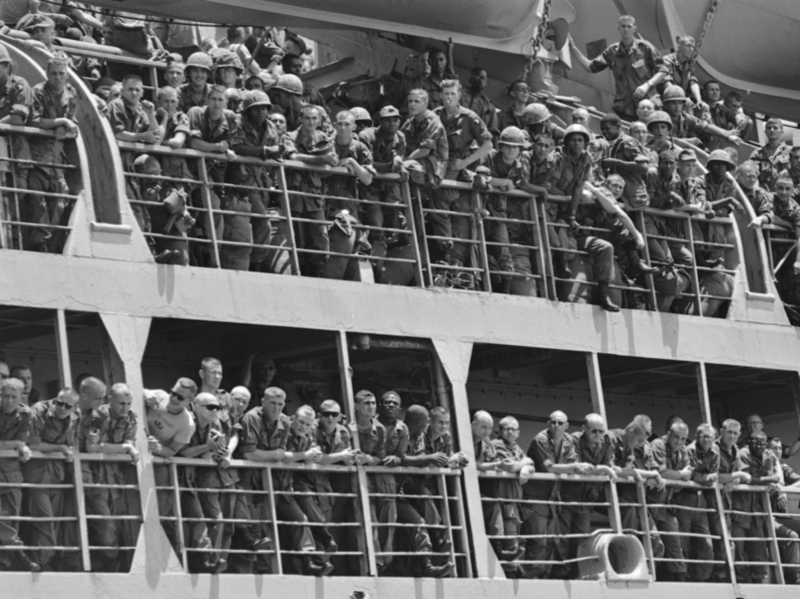 Troopers of the First Brigade of the U.S. 101st Airborne Division arrived at Cam Ranh Bay on July 29, 1965. China has been trying to exert sovereignty over the South China Sea, a territory that is rich in oil and gas, and fish, and through which more than $5 trillion worth of global trades passes each year. China lays claim to a number of islands and recently has been building artificial islands out of reefs and atolls, turning them into military outposts complete with ports, radar facilities and landing strips. The U.S. maintains the South China Sea is an international waterway, where ships can pass freely and unimpeded. To that end, it's carried out naval and air operations to challenge China's territorial claims. Anthony Nelson, director of the U.S.-ASEAN Business Council, says China's aggressive behavior really changes the dynamic in the region. "We've seen a real change in the security environment in the region with China's rise, and I think the U.S. has seen that Vietnam is one of the countries that looks at the region and sees the U.S. as a really positive partner and a force for the continued international order," he says. In response to China's moves in the South China Sea, the U.S. has been tightening some of its security partnerships and increasing its military presence in the region, says Michael O'Hanlon, a senior fellow at the Brookings Institution and the coauthor of a book on U.S.-China security relations, Strategic Reassurance and Resolve. "It's move, counter-move," he says. "Hopefully, it's short of war." The U.S. already has naval bases in Japan, Korea and Singapore. It also recently signed a new security agreement with the Philippines to open eight small bases for maritime operations. Better relations with Vietnam would enhance U.S. presence in the region. The U.S. Navy already made four port visits in Vietnam in 2015. O'Hanlon says ultimately the U.S. would like the opportunity to increase the frequency or significance of its visits to Cam Ranh Bay if China continues its "bullying." "In a worst case," he says, "we can imagine an alliance with Vietnam or a permanent military presence in Cam Ranh Bay as a way to give us additional places from which to watch Chinese activity to help defend allies."